Some states require official license plates both front and rear. Some folks, who live in states that require only one license plate, have personal requirements for displaying their allegiance to their favorite college football team. 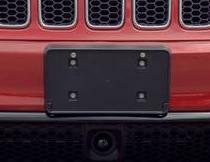 Whatever your requirements, this Mopar front license plate bracket is the same one that comes on the Jeep Grand Cherokee SRT8 and will hold your front license plate neatly and securely no matter what message, official or unofficial, you plan to display. Get yours at JustforJeeps.com. Will only fit 2012-2018 SRT8 Grand Cherokee models. Excellent product. Exactly as advertised. Fits great easy to install. 2012 SRT. Helps with 2 people, 1 to press into place, 1 to drill the holes in the perfect location! The license plate holder fits my 2014 SRT Grand Cherokee perfectly and installation was easy. I received the license plate holder quickly from JustForJeeps. However, the holes don't line up for California license plates. I'm sure its a California issue - they have a tendency of being different, ah, difficult on everything. Will probably just drill new holes in the license plate.